After a deeply traumatic season at Manchester United, that saw the once highly respected Everton boss handed the sack, David Moyes recently took up the managerial hot seat at Real Sociedad and finally made his debut against Deportivo La Coruna yesterday. 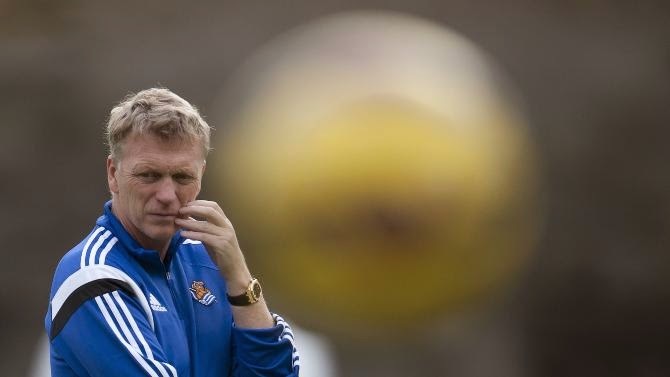 With over 200 Real Sociedad fans following their side to Riazor, Moyes first match coming after twelve days after taking up the position at the club finished in a fairly dull 0-0 draw. It hadn't been the best preparation for Moyes's side however as bad weather forced their plane to land at an airport more than 70km's away from La Coruña. They were also without the injured Mikel González, Iñigo Martínez and Xabi Prieto. Real Sociedad played some good football in the first half, but even Moyes admitted his disappointment at their second half as his side struggled to maintain possession and Deportivo had much better chances to score. But on a night when Lionel Messi shattered the all-time La Liga goalscoring record and with Real Sociedad's match dumped into the dreaded 22:00 timeslot, Spain's national broadcaster Cuatro opted to drop their coverage of the match to a lesser station and instead show Madagascar 3 on the main network. Undoubtedly there are quite a few United fans that would have opted for the adventures of Alex, Melman, Gloria and Marty than some of the dreck served up at Old Trafford last season. But that said, Moyes is a good manager as his time at Everton proved and if he's able to turn around Real Sociedad's fortunes it's inevitable that their media coverage will also improve.